Beginning in the early 1890s, and continuing for over 40 years, Lake built a succession of submarines through which he developed some portion of the submarine technology in use today. He is generally credited with developing the first workable periscope, and pioneering the use of hydroplanes fore and aft to achieve submergence while maintaining an even keel. His contributions to the navy and the marine industry were widespread, and his inventive genius places him among the important naval architects in American history. His submarine business ventures were never terribly successful, however, and he died a poor man. 1935, Nevada. 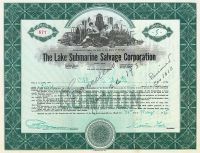 Stock certificate for 5 shares of the Lake Submarine Salvage Corporation. Green/Black. Vignette of two male allegorical figures surrounded by machinery and buildings in the background. Signed by Simon Lake as President. (1866 - 1945). Inventor, Submarine pioneer. Beginning in the early 1890's, and continuing for over 40 years, Lake built a succession of submarines through which he developed some portion of the submarine technology in use today. He is generally credited with developing the first workable periscope, and pioneering the use of hydroplanes fore and aft to achieve submergence while maintaining an even keel. His contributions to the navy and the marine industry were widespread, and his inventive genius places him among the important naval architects in American history. His submarine business ventures were never terribly successful, however, and he died a poor man. Pen cancelled and very fine. 1920, Maine. 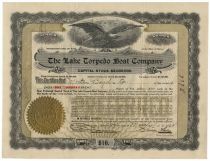 Stock certificate for 100 shares of the Lake Torpedo Boat Company. Black/Gray/Gold with gold seal. Vignette of eagle with spread wings at top center. Signed by Simon Lake, as Vice President. (1866 - 1945). Inventor, Submarine pioneer. Beginning in the early 1890's, and continuing for over 40 years, Lake built a succession of submarines through which he developed some portion of the submarine technology in use today. He is generally credited with developing the first workable periscope, and pioneering the use of hydroplanes fore and aft to achieve submergence while maintaining an even keel. His contributions to the navy and the marine industry were widespread, and his inventive genius places him among the important naval architects in American history. His submarine business ventures were never terribly successful, however, and he died a poor man. Stamp cancelled. Very fine. 1899, New Jersey. 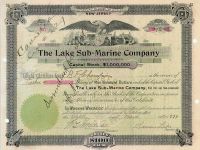 Stock certificate for 12 shares of the Lake Submarine Company signed as president by Simon Lake. (1866 - 1945). Inventor, Submarine pioneer. Beginning in the early 1890's, and continuing for over 40 years, Lake built a succession of submarines through which he developed some portion of the submarine technology in use today. He is generally credited with developing the first workable periscope, and pioneering the use of hydroplanes fore and aft to achieve submergence while maintaining an even keel. His contributions to the navy and the marine industry were widespread, and his inventive genius places him among the important naval architects in American history. His submarine business ventures were never terribly successful, however, and he died a poor man. Black with green overlay and green seal. Vignette at top center of eagle with spread wings. Pen and punch cancelled. Very fine.